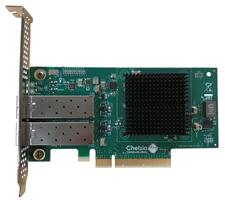 Chelsio T6 25GbE and 100GbE iWARP RDMA enabled Unified wire adapters are qualified with the IBM Storwize family all-flash and hybrid storage solutions to enable a cost-effective, optimized operation expense, and flexible heterogeneous storage systems. The following Chelsio Adapters were certified to be OpenPOWER Ready. The Chelsio iSER and iSCSI Offload Initiator drivers are inboxed in all major Linux distributions like RHEL7.4. Initiator machines with these drivers can connect to the IBM Storwize family storage systems. Please use the below package to update the Firmware on the Adapters.